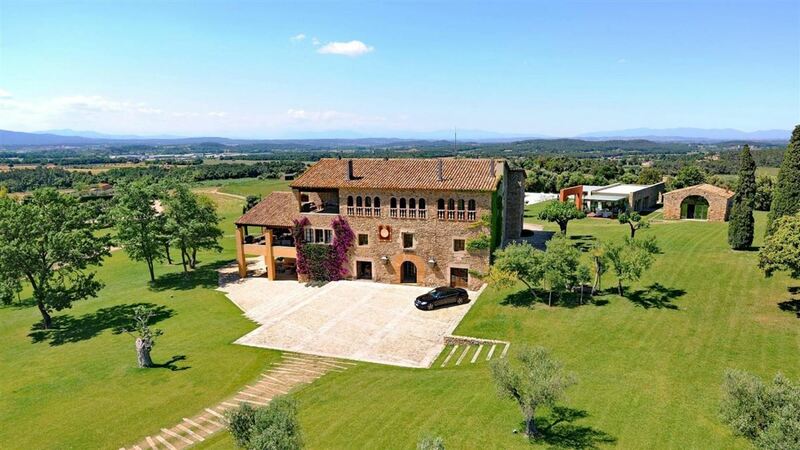 This extremely exclusive estate located in Catalonia’s region of Empordà, Spain, and is situated 5.5 miles away from Costa Brava. Estate is settled within one of Empordà’s largest natural parks “Les Gavarres” and just over an hour away from the metropolis of Barcelona and its international airport. Empordà is a gastronomical hotspot (eleven Michelin star restaurants with 20 Michelin stars between them within very close proximity, including the world renowned “El Celler de Can Roca” which was voted the best restaurant in the world in 2013), as well as a golfing destination (many golf courses are situated within close proximity including a top one in Spain PGA Catalonia) and a cultural and historical destination as the region is framed by various medieval villages and the Salvador Dalí area. Casa Pairal (15,900 square feet) comprises the main property of this splendid 18th Century Spanish estate, which is completed by further dwellings which provide an additional thirteen bedrooms. The main property has preserved all of its style and grandiosity which is characteristic of the lavish mansions of the era, whilst at the same time also brandishing ultra-modern features within the confines of its dazzling walls. 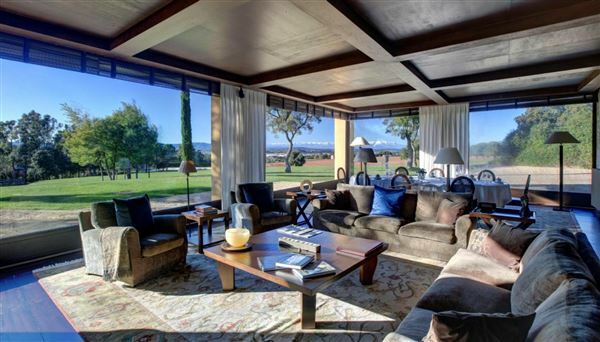 A property which has accommodated dignitaries, Royalty and celebrities from all over the world. Originally built over 250 years ago as a Grand Estate, this high-end property has been elegantly renovated to its former splendor, combining classical, centuries-old features with a wide range of state-of-the-art installations. 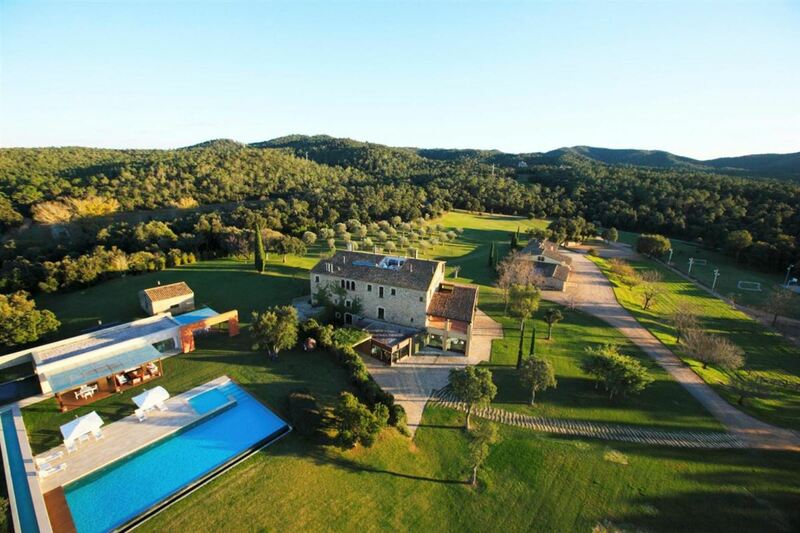 Settled amongst the rolling Gavarran Mountains, right in the heart of Girona, the main property is framed by a sprawling forested estate measuring approximately 173 acres, guaranteeing complete and utter privacy. An extensive outdoor summer pavilion forms estate's exterior; which is comprised of an ancient barn which houses a summer kitchen; a large infinity swimming pool; a football pitch; basketball court; paddle-tennis court; an outdoor barbecue area; as well as the summer pavilion itself, with sofas in the interior and exterior and large dining areas, as well as expansive open spaces where one can relax, walk, run and roam. With the capacity for 26 people, estate's bedrooms are all uniquely distinctive and decorated with exquisite Catalan touches, completed by locally sourced rugs, unique family heirlooms, and distinctive fireplaces, with a selection of the bedrooms opening onto their own private terraces. Aside from the cosy lounge, the property also features a cinema room, spa and gym, as well as an elegantly appointed additional lounge, complemented by a full-size snooker table and comfortable sofas. With widespread views over Costa Brava, the property accommodates Southern Europe’s leading equestrian facilities which have hosted Spain’s highly esteemed National Dressage Team. One of the world’s best dressage horse training facilities, which has even accommodated Spanish Olympic horses with the highest provenance. This charming estate has also played host to highly private corporations, all requiring a private and peaceful ambience. Property is equipped with all of the essential state-of-the-art facilities which are needed to host small to medium sized board meetings and private business functions and events.